Simcoe, ON – April 8 – If you’ve ever wanted to paint like legendary local artist Eva Brook Donly, now is your chance. 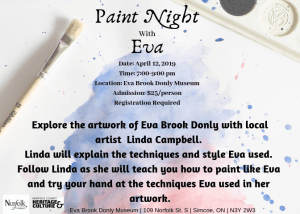 On April 12, Eva Brook Donly Museum & Norfolk County Archives with be hosting a paint night, focusing on the work of Donly herself. Local artist Linda Campbell will teach about the style and techniques that Mrs. Donly used in her artwork. Participants will then paint their own watercolour, replicating Eva’s techniques. It’s a great opportunity to learn about Eva, spend time with friends, and create your own masterpiece! Campbell has a degree in Art and Art History from McMaster University and works in a variety of media including acrylics, fibre arts, and watercolours. Her work has been displayed in a variety of galleries in Ontario as well as in Texas and Belgium. Tickets are on sale now for $25 per person. Due to limited seating, registration is required so buy your tickets today! For tickets or further information, please visit Eva Brook Donly Museum & Norfolk County Archives, 109 Norfolk St. S. Simcoe, call 519-426-1583, or email ebd.museum@norfolkcounty.ca.